Following the passing of the second amendment to the pension act at the parliament yesterday, the Maldives Pension Administration Office (MPAO) has said that foreign employee participation in the pension scheme is now voluntary. In a statement issued yesterday, the office said that employers are now permitted to delay the foreign employee pension contribution for the month of May. Quoting Ismail Sujau, a director at MPAO, Sun Online has reported that the office has decided not to collect from those who are registered with the scheme this month as a lot of people have already started withdrawing from the scheme after it was made voluntary. As of April, a total 3854 foreign employees have registered with the retirement pension scheme, reported Sun. Adhaalath Party representative Hussain Wafeer has denied allegations that Maldivian Democratic Party (MDP) supporters “physically attacked” its members on the island of Thulhaadhoo in Baa Atoll last week. The comments were made after local media reported that a crowd of “violent thugs” – led by an unnamed MDP councillor – attempted to attack Adhaalath Party President Sheikh Imran Abdulla during a visit to the island. An unnamed source from Thulhaadhoo previously told the Sun Online news service that the attackers threw stones at the visitors, injuring several people during the incident. Despite the claims, Wafeer told Minivan News today that while the gathered crowd did not physically attack anyone during the visit, sand was thrown at Adhaalath party representatives. Wafeer refused to speculate on whether the crowd were true MDP members, or whether an MDP Councillor had been involved in the alleged attack. “They were waving MDP flags, so we can assume they were MDP, but we didn’t recognise any of the members so we can’t say they were MDP,” Wafeer added. An official from within Thulhaadhoo Island Council – speaking on condition of anonymity – said that the crowd who greeted the Adhaalath Party officials was both a mix of MDP and anti-MDP supporters. The council source said it was not certain who had thrown sand at Sheikh Imran. “Some of local women on the island witnessed a Dhivehi Rayyithunge Party (DRP) councillor throwing sand and causing the trouble, while some people said it was the MDP supporters,” the council official claimed. Adhaalath Party Leader Sheikh Imran Abdulla was not responding to calls from Minivan News at time of press. Following the incident, a senior MDP MP told Minivan News that he had received death threats via telephone from unknown callers whom he believed to be members of the Adhaalath Party. According to Sun Online, the police have arrested a number of individuals allegedly involved in the incident, including an MDP councillor. Following an MDP protest held in Male’ on Friday (January 25),the Adhaalath Party alleged that demonstrators had verbally abused its supporters and vandalised promotional materials at a membership drive held at a school. The party also claimed MDP protesters ripped up the party’s banners at the school, which were temporarily put up as part of the membership drive. Responding to the allegations at the time, MDP MP Hamid Abdul Ghafoor claimed that while the party did not encourage such behaviour towards government-aligned parties, he said he would not be surprised if some supporters had ripped up banners during the protest. Former President Mohamed Nasheed returned to Male’ around 10:30pm Thursday night following a trip to Bangkok where he was visiting his ill father, reports Sun Online. 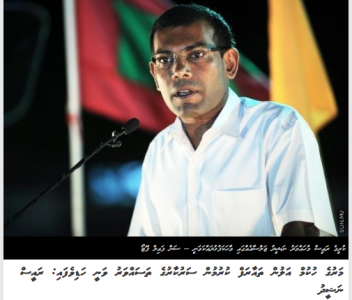 Nasheed left the Maldives December 25, 2012 following multiple immigration delays to his departure to Thailand. This included the withholding of his passport due to the ongoing trial against him in relation to the arrest of Criminal Court Chief Judge Abdullah Mohamed while he was president, as well as a “technical error” at Ibrahim Nasir International Airport on December 21, local media reports. The Housing Development Corporation (HDC) has conducted a pre-bid meeting with six foreign parties interested in carrying out the second phase of the Hulhumale’ land reclamation project, reports local media. With a cost of US$60 million the project is the largest of its kind in the Maldives, and will involve 230 hectares of reclaimed area suitable for a population of 100,000, Sun Online reported. “Bids should come before the end of this month. As soon as bid evaluation is complete, the project would commence”, an HDC official was quoted as saying. Companies involved in the bid included those with previous experience in the Maldives, including Royal Boskalis Westminster, Sun reported. The Civil Service Commission (CSC) has asked the Pension Office to release a lump sum of MVR 2.5 million as pension for eight civil servants who retired between 2008 and 2010, reports Sun Online. Sun Online has obtained a letter from the CSC to the Pension Office requesting pension funds for the eight individuals from April 2011 onward. The Pension Office has however contended that the individuals were not entitled to a government pension under the Public Finance Act. The retired civil servants were Hussain Moosa, of Finivaage Kaashidhoo, retired on January 5, 2009 after 22 years, 11 months and 24 days (MVR90,000); former Deputy High Commissioner to the UK, Adam Hassan, of Ocean Lodge, retired on 3 June 2008 after 24 years and 22 days (MVR320,000); Mohamed Zuhair, of M. Oceania, retired from the post of Chief Executive Officer on 7 August 2008 (MVR343,000); Abdullah Shakir, of Baikan’dige Aage, retired from the post of Assistant Director on 22 September 2008 (a monthly pension of MVR2,417 monthly in addition to a lump sum of MVR120,000); Ahmed Wajeeh, of Hazaarumaage, retired from the post of Executive Director in September 2008 (MVR120,000); Abdul Haadhee Ibrahim Didi of Aasikkage, M. Muli, retired after 27 years, 9 months and 19 days (MVR114,600); Abdullah Faroog Hassan, of Primrose, Fuvahmulah, retired from the post of Commissioner on 7 August 2008 after 39 years, 11 months and 7 days (MVR1,000,000); and Adhnan Abdullah, of Kudhimaage Haa Alif Ihavandhoo, retired on 7 June 2010 after 34 years, 2 months and 14 days (MVR219,120). Banners and posters put up at the Ibrahim Nasir International Airport to promote the SAARC summit in Addu City feature the image of Jesus Christ, reports Sun Online. The online paper reported that it received a number of calls complaining about the Christian imagery. The visual art set to the theme of ‘Building Bridges’ was designed by local company Mooinc Pvt Ltd.
Mooinc Creative Director Ali Saeed said the designs were based on five themes approved by the cabinet to depict the culture and religion of the eight SAARC nations, where some 10 religions are practiced. Under Religious Unity Regulations published by the government in September, it is illegal to propagate any other religion other than Islam, to carry or display in public books on religions other than Islam, and the translation into Dhivehi language such books and writings on other religions. Proselytising by foreigners remains punishable by deportation. The regulations interpret the Religious Unity Act passed by parliament in 1994, which carries a 2-5 year prison sentence for its violation. An Indian teacher working in Raa Atoll was arrested and deported in October for possession of Christian imagery and a Bible, after another teacher contacted police after finding hymn videos on the desktop of a school laptop. Kokkattu claimed he had allegedly transferred the files from his personal flash drive by accident. Kokkattu’s subsequent detention drew media attention in India, and the Global Council of Indian Christians (GCIC) demanded the Indian government seek an apology from the Maldives for Kokkattu’s treatment. The Elections Commission (EC) has accused local media outlets Sun Online, Villa TV and DhiTV of reporting “falsehoods” in their coverage of the Progressive Party of Maldives (PPM) submitting registration forms to the commission this week. The private media outlets had reported that the PPM founding members were made to wait at the commission when they arrived to submit the forms and none of the EC members were present to receive the delegation, led by former President Maumoon Abdul Gayoom’s son Farish Maumoon. The EC statement noted that the commission had never conducted special ceremonies to receive registration forms.